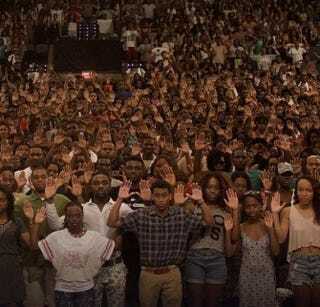 Howard University students posing for a #DontShoot photo posted on Twitter Aug. 13, 2014. Video captured hundreds of protesters in Ferguson, Mo., chanting “don’t shoot” Wednesday night, as police outfitted in full military equipment yelled at them to stay at least 25 feet away. With their hands raised in the air, the protesters, who were acting in a peaceful manner, complied with the law-enforcement requests. As the sun came down, police informed the protesters that their rights to protest had been denied. Cops in Ferguson fired rubber bullets and tear gas bombs at the protesters and journalists covering the night. As law enforcement approached the protesters, many tried their best to scurry off into the neighborhood. As many on social media were watching everything unfold through various live streams available online, as a sign of solidarity, #dontshoot photos became prominent. According to Dorian Johnson, a witness to Michael Brown’s shooting, Brown was facing the officer who shot him with his hands in the air. Various people, including a group of freshman students at Howard University, posted photos with their hands in the air captioned with #dontshoot. As residents in Ferguson stand in solidarity, and Mike Brown’s parents grieve for the loss of their son, one can only hope that change eventually comes.